What a great beach bay. 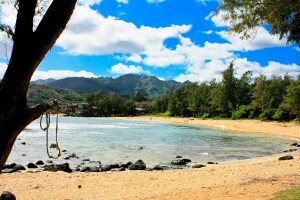 Along with the sun and surf at Moloaa Beach Bay, it has a nice beach path toward the north. It winds along the oceans edge for about a half a mile. At the end of the trail is a coral reef and rock outcropping. There were lots of green sea turtles at the coral outcrop. The trail dead ends into the nature conservatory, which is off limits. In the winter time the path is a fantastic place to watch whales. You can actually do the path in flip-flops so take off and enjoy. The Moloaa Beach path at the southeast end of the bay is lined with lava boulders. You spend a lot of time hopping from one bolder to the next and the view at the end is just more shoreline and boulders. Don’t miss the northern end, it is very nice.